How about a review for this Friday?! Today I’ve got the very spring-y “Medusa’s Verde” from Delush. After raving about the neon crelly glitters from this summer, I have been super excited to try something a little bit different. For the accent nail, I went with KBShimmer “Sun and Games” (reviewed here), because I thought it went nicely with the gold glitter in “Medusa’s Verde.” (Also because I’m now obsessed with “Sun and Games” and want to use it all the time.) Playing on the gardeny aspect of the polish’s name and color, I added some floral using Bundle Monster black stamping polish and the BM-XL05. If you’re into great, opaque glitter polishes, definitely check out Delush! For Fall, they’re releasing a “Dames of Thrones” collection that I’m super excited about. On Delush’s site, you can pick up both minis and full-sized bottles. The base color on this is gorgeous! oooh I love this and that accent nail is tdf!! 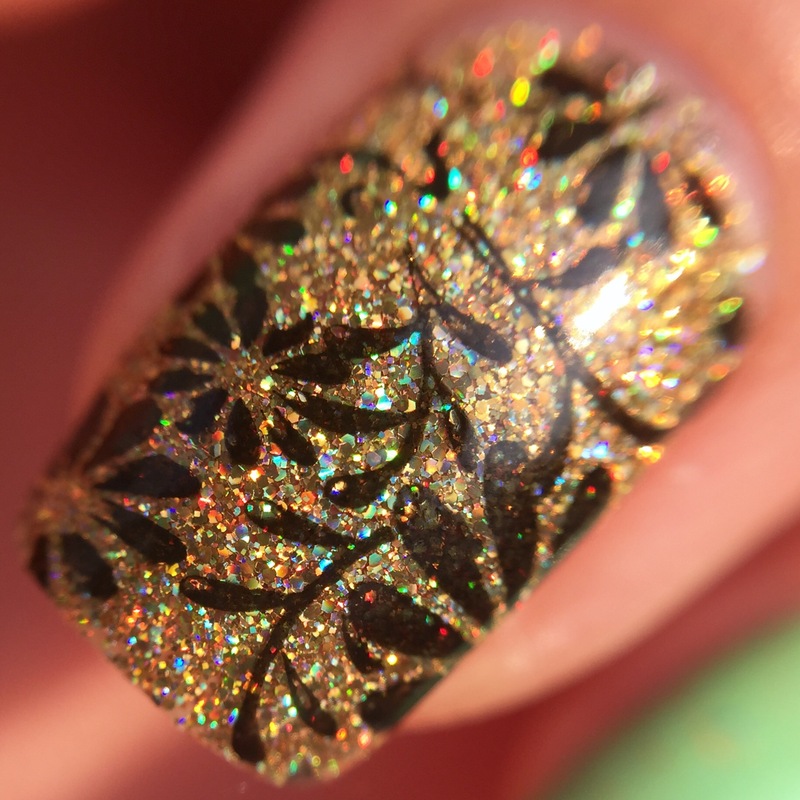 The stamping on the accent makes this entire mani. Love the entire mani! The accent nail is gorgeous!! This color is so pretty, and your accent nail is absolutely fabulous!! Love the minty green base color mixed with the gold glitters. Stunning green! I love a good green polish! Such a cute crelly! And I love the gold used for the accent nail, so much sparkle. this would be delightful for St Patricks Day! Not a huge green fan but this is really pretty, the glitter isn’t OTT and is the perfect accent to the color.